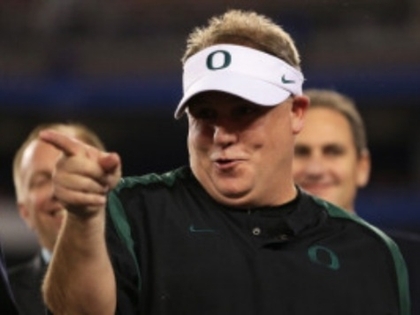 The Philadelphia Eagles hired Oregon head coach Chip Kelly as their next head coach on Wednesday. The Oregon head coach, who led the Ducks to four straight BCS bowl appearances, will leave Oregon just a week after he announced he would be coming back to the school. Kelly will find out if his fast-paced offense, which has been described as “basketball on grass,” can succeed in the NFL. “He will be a great leader for us and will bring a fresh and energetic approach to our team,” Eagles owner Jeffrey Lurie said in a statement. Oregon may be on the verge of NCAA sanctions, and Kelly, may be jumping ship. It is what Pete Carroll did when he left USC to go to the Seattle Seahawks before USC was hit with NCAA sanctions. Kelly will replace former Eagles head coach Andy Reid, whom the Eagles fired after he coached the team for the last 14 years. It will be interesting to see whether Kelly will decide to keep quarterback Mike Vick, who is type of mobile quarterback that has often thrived in Kelly’s offense–at least at the collegiate level. Oregon remains loaded–with offensive superstars such as De’Anthony Thomas and quarterback Marcus Mariota returning–but the next Ducks coach will have to do deal with looming NCAA sanctions.